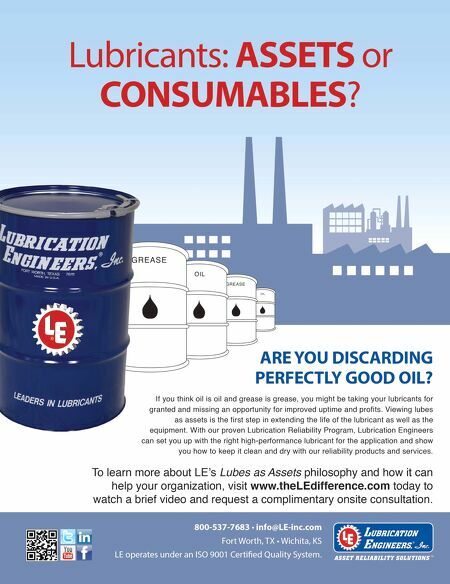 THE "LUBE-TIPS" SECTION OF MACHINERY LUBRICATION MAGAZINE FEATURES INNOVATIVE ideas submitted by our readers. Additional tips can be found in our Lube-Tips email newsletter. If you have a tip to share, email it to us at editor@noria.com. 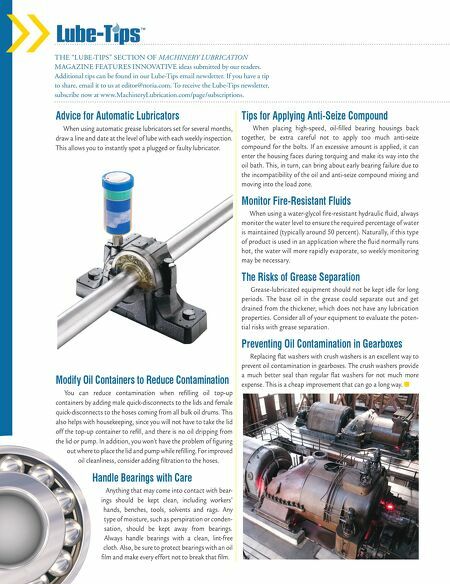 To receive the Lube-Tips newsletter, subscribe now at www.MachineryLubrication.com/page/subscriptions. Advice for Automatic Lubricators When using automatic grease lubricators set for several months, draw a line and date at the level of lube with each weekly inspection. This allows you to instantly spot a plugged or faulty lubricator. Modify Oil Containers to Reduce Contamination You can reduce contamination when refilling oil top-up containers by adding male quick-disconnects to the lids and female quick-disconnects to the hoses coming from all bulk oil drums. This also helps with housekeeping, since you will not have to take the lid off the top-up container to refill, and there is no oil dripping from the lid or pump. In addition, you won't have the problem of figuring out where to place the lid and pump while refilling. For improved oil cleanliness, consider adding filtration to the hoses. Handle Bearings with Care Anything that may come into contact with bear- ings should be kept clean, including workers' hands, benches, tools, solvents and rags. Any type of moisture, such as perspiration or conden- sation, should be kept away from bearings. Always handle bearings with a clean, lint-free cloth. Also, be sure to protect bearings with an oil film and make every effort not to break that film. Tips for Applying Anti-Seize Compound When placing high-speed, oil-filled bearing housings back together, be extra careful not to apply too much anti-seize compound for the bolts. If an excessive amount is applied, it can enter the housing faces during torquing and make its way into the oil bath. This, in turn, can bring about early bearing failure due to the incompatibility of the oil and anti-seize compound mixing and moving into the load zone. Monitor Fire-Resistant Fluids When using a water-glycol fire-resistant hydraulic fluid, always monitor the water level to ensure the required percentage of water is maintained (typically around 50 percent). Naturally, if this type of product is used in an application where the fluid normally runs hot, the water will more rapidly evaporate, so weekly monitoring may be necessary. The Risks of Grease Separation Grease-lubricated equipment should not be kept idle for long periods. The base oil in the grease could separate out and get drained from the thickener, which does not have any lubrication properties. Consider all of your equipment to evaluate the poten- tial risks with grease separation. Preventing Oil Contamination in Gearboxes Replacing flat washers with crush washers is an excellent way to prevent oil contamination in gearboxes. The crush washers provide a much better seal than regular flat washers for not much more expense. This is a cheap improvement that can go a long way.